Congratulations to Patricia and Gracie for a safe return home! Special thanks to K9 Riley for his help on this case and for Sherry and her work with starting them out on a Found by Phone consult! 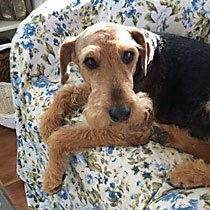 Gracie a 10 year old Airedale Terrier went missing on November 28 with her other small dog when a worker left a gate open. Patricia found the one dog right away on the next street when someone picked it up. Gracie was still missing. Dogs Finding Dogs started off with a Found by Phone consult to get things in motion. Then DFD search team came out and tracked to a nearby wooded area and even found paw prints. Gracie was found right there by a man walking his dog. She would not approach him, but did approach his dog. He was able to grab her collar and leash her with his dogs leash. Patricia didn’t understand how Gracie could be so close and not come home. Always check your gates after having work done in your yard. This happens all the time with cable companies, yard services and the like.